Cf. 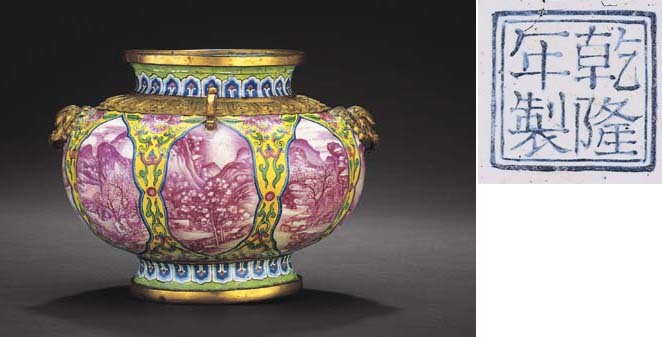 a covered jar in the National Palace Museum, Taiwan, decorated with four ruby-red landscape panels on yellow-ground floral scrolls, and additional blue-enamel landscapes on the shoulder, illustrated in Enamel Ware in the Ming and Ch'ing Dynasties, Taiwan, 1999, pl. 115. It is quite unusual to find ruby-enamelled landscapes as the main decoration on a piece, as they tend to appear as secondary motifs on several Beijing enamelwares, such as on the zhadou illustrated ibid., pl. 117; and on the covered bowl in the Beijing Palace Museum, illustrated in Metal-bodied Enamel Ware, The Complete Collection of Treasures of the Palace Museum, Hong Kong, 2002, pl. 202.